The Rosetta Magellan's design is inspired by classic pens of the 1920's and 1930's. The gold or chrome trims are a perfect accent to the colorful Italian acrylics. The Magellan is manufactured from parts from all around the world. The Italian acrylics are machined in Taiwan. The inner components are from Germany. The final assembly is completed in Michigan, USA. 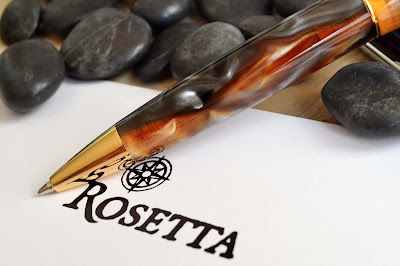 The Rosetta Magellan ballpoint pen accepts a Parker-style ballpoint refill. Here at iPenstore, we recommend the Schmidt P900. The Magellan is equipped with a blue medium ballpoint refill, but black is available upon request. The Schmidt P900 is an excellent, smooth writing, and reliable refill. Blue and black refills in medium point are the most popular and common, but we have a rainbow of colors in the Parker-style ballpoint refill available on ipenstore.com. 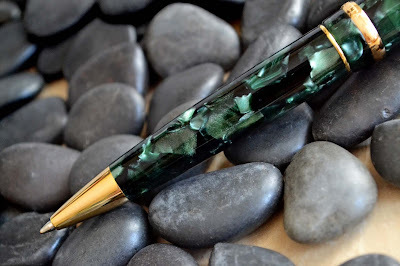 Parker-style ballpoint refills are available in a gel as well. If you are not sure about which refill is best for you, contact us and we'll be happy to help!